Unless you were whelped and spent your formative years in the northern extremities of Maine, New Hampshire and Vermont or in lower Québec Province, being misinformed as to what a sugar shack or sugar house (cabane à sucre in Nouvelle-France) is can be dismissed as a forgivable offense. 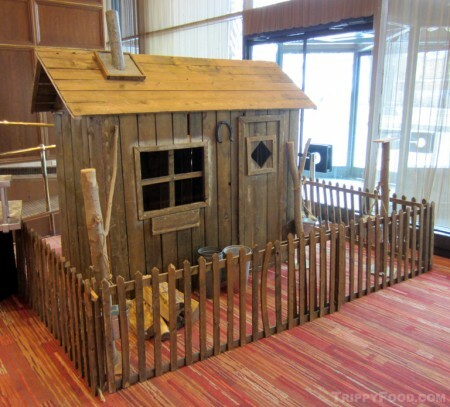 In popular American culture, the term or title "sugar shack" has been applied to "gentlemen's" clubs, coffee houses (thank you, Jimmy Gilmer), pastry shops, and even the Ernie Barnes painting that served as the album cover of Marvin Gaye's, "I Want You"; in fact, the sugar in question is the lifeblood of your neighborhood IHOP - maple syrup. You get a pass if you've been underwhelmed by the lackluster viscous fluid that in some places can only be legally called "syrup". The closest that the Mrs. Butterworth, Aunt Jemima or Log Cabin syrup you're liberally decanting across your processed white flour pancakes came to a maple tree was the one the delivery truck parked under. These commercial brands differ in their composition, but share primary ingredients: high fructose corn syrup, corn syrup, water, salt, cellulose gum, caramel color, sodium hexametaphosphate, and natural and artificial flavors. Log Cabin has the sincerest form of flattery, with their "All Natural" syrup containing a whopping 4% maple. There's a popular ad campaign by the corn industry that claims "sugar is sugar" and "your body can't tell the difference", and while it's true that your body processes sugars as glucose, what is passable to your bloodstream gets failing grades from your taste buds. When you're gliding down the aisle at the Piggly Wiggly in your Sunday best, paying up to 75% less for that bottle of pancake (or table) syrup is going to be easier to swallow when the kids are emptying it onto their waffles like the Saint Laurence flows into the Atlantic. It would be easy to say real maple syrup is more expensive because it's worth it, and while it's true that once you start squandering Junior's college fund on the real deal, you will probably never go back to Hungry Jack again; the fact of the matter is that maple syrup is expensive to buy because it's expensive to make. 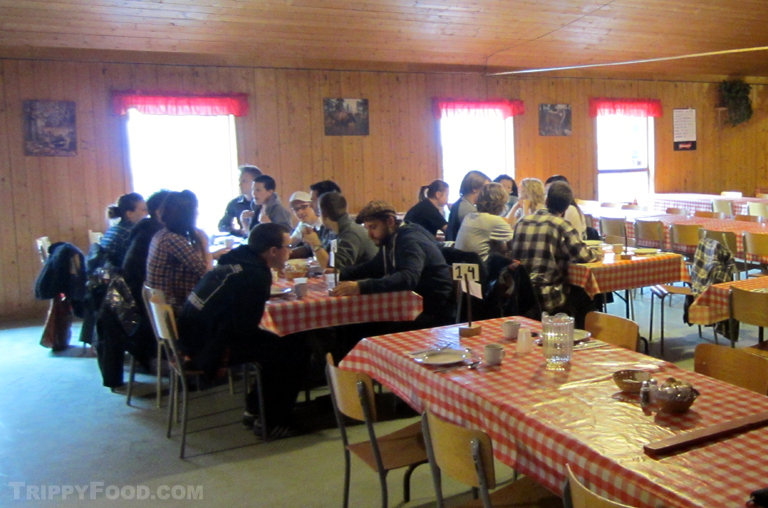 Harvesting real maple syrup is a painstaking, manual process that is largely seasonal. Many commercial producers may own or lease acres of land dense with sugar or black maple trees; smaller, family-owned producers will likely have érablière or sugar bush (a stand or cluster of maple trees) somewhere on their property. Most Québecers will share with you that almost everybody knows somebody with maples on their property that knows how to collect and process the sap, if only for personal use. Land with a more substantial concentration of maples will likely have a sugar shack on the property. Until recently, the collection process involved hammering a tap into the tree from which a bucket is hung to collect the light golden sap that is excreted. Workers gather the buckets and bring them to a shed or barn where the sap is boiled down to the desired consistency through evaporation (less boiling produces a light amber syrup, while cooking the sap down longer results is a dark, thick product). 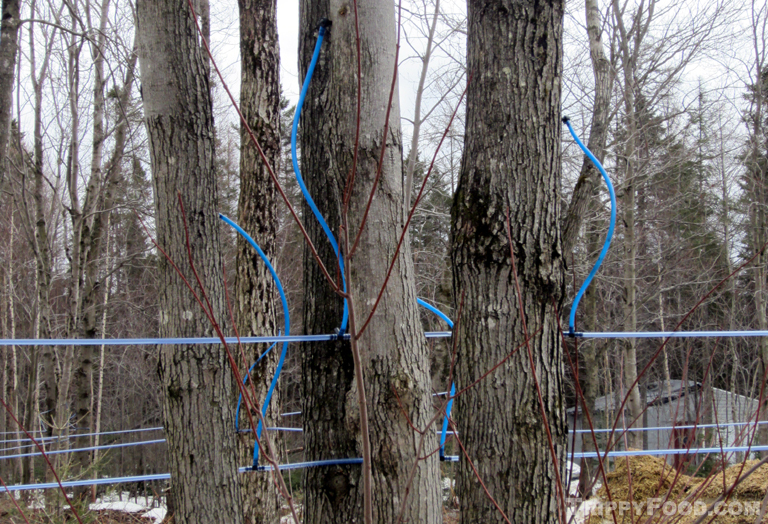 Today, it is more likely that a less labor-intensive spider-webbing of tubing and pumps are employed with the interlaced maple raceways looking like some bizarre arboreal intravenous system. Although maples produce sap from early winter through the beginning of spring, there is a relatively short sugaring window, thanks to Mother Nature and physics. In the freezing winter months, extracting the liquid is impossible; when the temperature rises above freezing all day and night, the tree stops producing. The high period for processing maple syrup is between the last two weeks in March and the first two weeks of April. and, a maple-rich dessert such as sugar pie (employing butter, vanilla, cream and maple syrup) or pouding chômeur ("poor man's pudding"), a cake of flour, water maple syrup and brown sugar. Naturally, there will be a bottle, pitcher or jug of maple syrup at the ready should you decide to sweeten the deal; there's no shame to be had in accessorizing any of the dishes, since the Québecers in attendance will freely admit that they liberally apply maple syrup to everything; absolutely, everything. 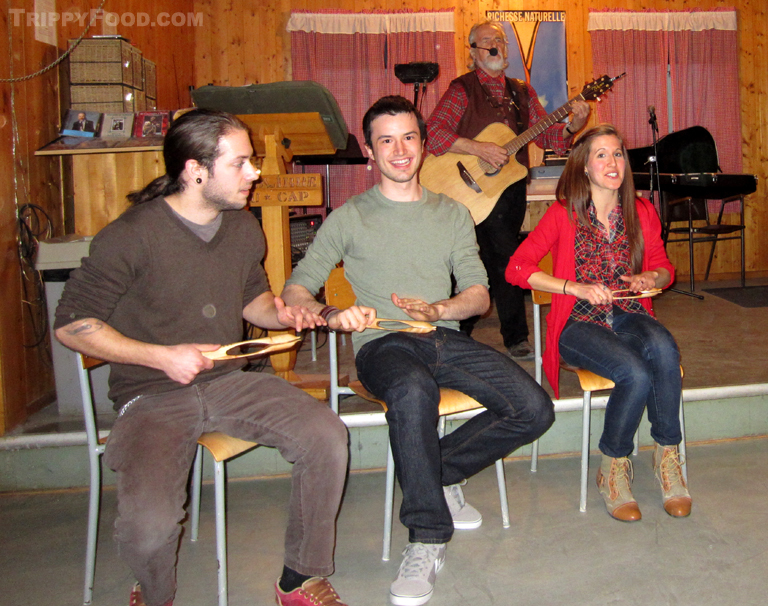 To enhance your regional dining experience, the dinner is often accompanied by live traditional or folk music, although some sugar shacks cut corners and pipe in canned music (which is fine if you like your tourtière to the strains of Celine Dion or Rush); other activities may include dancing, or at the sugar shack I visited, the playing of what is generically referred to as "Québec wooden spoons". Any sugar shack worth their salt will end the festivities with the unique confectionary treat known as tire d'érable (maple taffee or toffee) - maple syrup is boiled down past the syrup stage, and (while still hot) poured out into lines on snow or crushed ice-filled troughs. 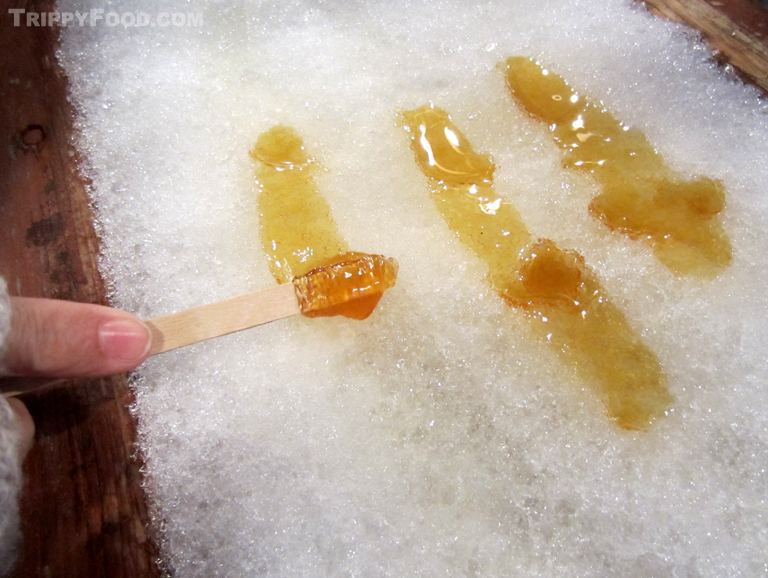 A stick is pressed into one end of the hardening amber goo and then rolled, resulting in a sweet, chewy roll of maple candy flecked with ice crystals. In March you can't sneeze without hitting an impromptu standalone shack, cart or stand throughout Québec Province (including in metropolitan Montréal and Québec) offering up this sticky treat. 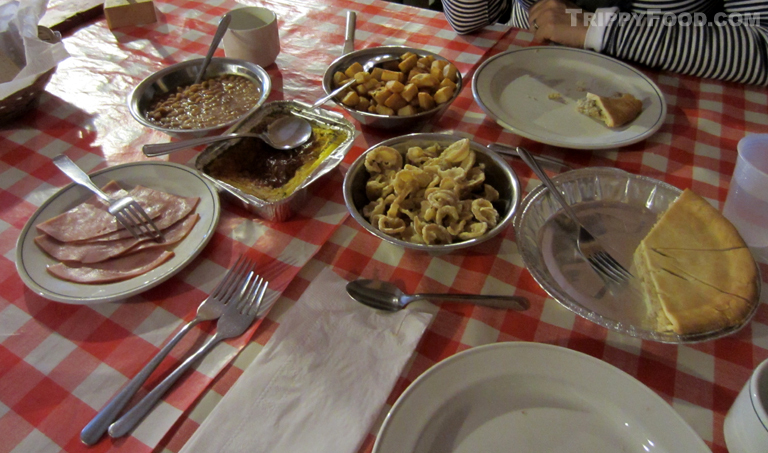 This entry was posted in Montréal, New England, Québec, Saint Nicolas and tagged Au Pied du Cochon, Aunt Jemima, baked beans, cabane a sucre, Cafe Buade, chicharrón, corn, corn syrup, Coureur des Bois, crepes, egg, Eggspectation, érablière, Erabliere du Cap, Ernie Barnes, foie gras, Gilles Gosselin, ham, high fructose, Jean-Talon, Jimmy Gilmer, L' Érablière du Cap, Les Délices de l'Érable, lobster, Log Cabin, Maine, maple, Marche, Marche du Vieux-Port, Marche Jean-Talon, Martin Picard, meat pie, Montreal, Mrs. Butterworth, New England, New Hampshire, Nouvelle-France, omelet, oreilles de crisse, pancakes, pork rind, potatoes, pouding chômeur, Quebec, Québecers, Saint Nicolas, sap, sausage, squirrel, St-Nicolas, sugar, sugar bush, sugar house, sugar pie, sugar shack, syrup, table d'hôtepea soup, taffee, tap, tire d'érable, toffee, tourtière, Vermont, wooden spoons. Bookmark the permalink.